Does the vendor listen more than talk? Does he or she seem flexible or rigid? Does he or she support your ideas or shoot down your ideas? Your gut instinct. Do you just click? Many of my clients' weddings require vendors to think outside the box and be creative. Some vendors are always used to doing things the same way every time. I like to push the envelope as you can see from the work above. 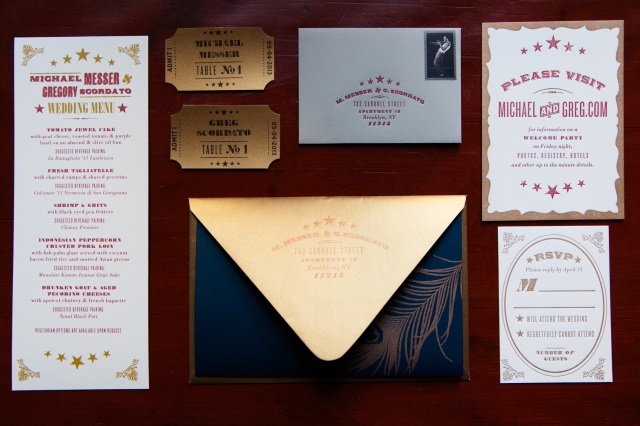 One of our favorite "team" members is Ladyfingers Letterpress who designed the beautiful invitations you see. What do you look for when hiring a wedding vendor? Me: Are you having a first dance? Me: Are you having anything tossed? Garter and bouquet are the typical things. Me: Are you dancing with your parents at all in any formal, announced way? Me: Are you cutting anything on the dessert display (this wedding has no wedding cake)? All of these are fairly common answers when we're planning a gay wedding, though. After all, those are traditional elements and many of our clients love the opportunity to be non-traditional and reinvent what weddings should look like! And you completely have permission to do so! The experience doesn't have to detract from the wedding or all the time spent dancing. If it's a performance, keep it short, 1-2 songs MAX and keep it upbeat and appropriate. What are you doing to add some conversation starters and entertainment to your wedding? Many gay and lesbian couples choose to process to the front of their sacred ceremony space down not one, but two aisles. Jen and I did this; each of our attendants alternated going down the respective aisle, then Jen and I walked parallel to each other simultaneously. It's fairly common for a number of reasons, the main one being that in a gay or lesbian wedding, there is not necessarily a "bride" who is expected to be the center of attention. Many gay and lesbian couples who are marrying have been together already for years and want to walk separately and meet in the middle. Regardless of whether the two aisles are parallel or coming in from opposite sides of the room, this two aisle processional is a nightmare for a photographer without an assistant! I've had a few photographers attempt to talk me out of this processional and even one trying to change it at the last minute. While there is something to be said about getting amazing wedding photographs and you'll never hear me argue otherwise, I do feel that it's important to honor this emerging gay and lesbian wedding tradition. If you are considering having two aisles instead of one central aisle, I highly recommend that you invest in a photographer's assistant if you are concerned about capturing both of your moments in the spotlight!